A deadly weekend weather-wise in Illinois, a dramatic warm-up over the weekend spawned tornadoes across the Midwest. Temperatures at the research center rose to 66 degrees on Sunday morning prior to the arrival of the storm front. Sustained hourly winds were measured at 25 mph. Fortunately, for those who still have corn standing; most fields seem to have weathered the storm with little additional lodging, although the corn plants do appear a little roughed up, and minus a few leaves. Our sympathies and wishes go to all affected by the turbulent weather over the weekend, including the communities of Washington, Coal City and Diamond. The soybean yield in Illinois is forecast at 49 bushels per acre, 3 bushels above the September 1 forecast. Production is forecast at 461 million bushels, a 20 percent increase over 2012. For those who are making selection decisions on 2014 corn hybrid and soybean varieties, the Illinois Variety Testing website can be a helpful resource. The University of Illinois Variety Testing program began in 1934. 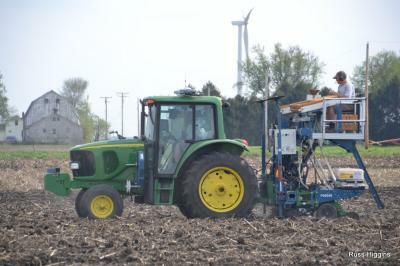 Crop performance tests are conducted annually to provide farmers, and private seed companies with information on hybrids and varieties of the major Illinois field crops. The trials are conducted in a research-based manner to minimize variability and insure the integrity of the results. Over the next several weeks I'll be joining NRCS soil scientist Mark Bramstead and resource conservationist Paul Youngstrum in a series of soil health seminars. Our locations include Dwight, Yorkville, Watseka, Streator, Bloomington and St. Charles. Contact your local Soil and Water Conservation District for dates and times and join us for the ½ day programs.